Victoria Blamey’s energy is somewhere between frenetic and controlled. It lives in her movements: staccato but clean, like complicated choreography. Consider the process behind her confit tomatoes — juicy red morsels soaked overnight in herbs and oil. She uses a pair of tongs to carefully fold back the paper separating each layer, and splays each tomato out on her board like a butterfly in a display case. A quick dice, then the tomatoes are measured into five different quart containers, destined for chupe, a favorite stew from her Chilean upbringing. It’s mesmerizing to watch the perfection of each of her movements—always angular, never slouching. Nothing is out of place in Blamey’s kitchen: not her hair, pulled back into a perfect chignon; not the arrangement of her facial features. She begins sentences with, “I am going to be honest, because that’s the problem with me,” and adds the word nothing to the middle of her sentences, like: “I moved to New York, and, nothing, I started working at Eleven Madison Park,” as if to say, just like that, casually shrugging off her impressive achievements. That? That’s just something I did. When one of her cooks asks for help during our interview, she stops mid-sentence to assist; 30 seconds later, she picks up exactly where she left off, down to the preposition, without skipping a beat. It’s odd to think, given the distinctly casual precision of the whole operation, that the kitchen where this is all taking place is part of a nearly century-old, notoriously rowdy New York institution, Chumley’s. A former speakeasy where Zelda Sayre supposedly married F. Scott Fitzgerald, it’s where the Hollywood Ten held court, and where the term “86” was invented. But this Chumley’s looks entirely different from the 1922 version, and that’s largely due to Blamey, who took over the kitchen when the restaurant was revived last year. She distinctly remembers the first time owner Alessandro Borgognone showed her around, back when it was a white box that still smelled faintly of beer. He told her he was going to reopen the space; without skipping a beat, she told him she had no interest in cooking bar food. Borgognone told her she could cook whatever she wanted. “All he asked was for two things: a burger and a tartare,” she says. She gave him both, but she did them her way: the burger laced with bone marrow and a mango-based barbecue sauce, and the tartare served not with capers and egg yolk, but with crackers made of dehydrated beef tendon. 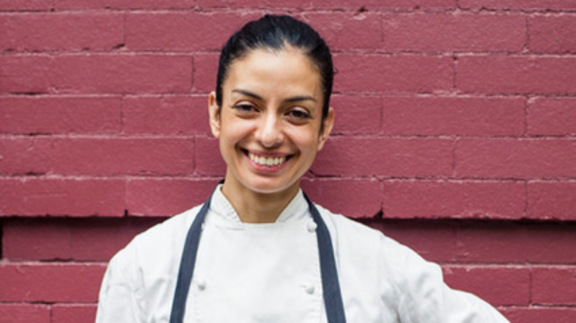 “Then they gave me one menu from, like, 2000, and I said, ‘Sounds great, but I am not doing a lobster special.’” Instead, she pulled inspiration from her Chilean heritage, coupled with her instinctual, whimsical style of cooking. The results included the aforementioned chupe served in a puff pastry shell, cognac fried chicken, and spring porridge with fava beans and pistachio butter. It’s not what you’d expect from a place like Chumley’s. It’s better. Blamey is in New York in spite of herself. She never wanted to come here. (The irony of her leading the charge at what is arguably one of New York’s most well-known addresses cannot go unstated.) She thought the kitchens wouldn’t be serious enough after the buttoned-up restaurants in Britain she was used to, like Gordon Ramsay’s Savoy Grill and the Vineyard Restaurant in Berkshire. Blamey decides she’s going to make me one of her new dishes on the menu — which is essentially a plate of cold greens. She takes a bunch of Broccoli di Cicco, steams the florets at exactly 85 degrees Celsius (any higher, and you lose the color, she says), plunges them into cold water, and then paints them, using a dainty brush to apply a ponzu glaze. Thin shavings of Brazil nut grace the top, which at a glance is indistinguishable from Parmesan cheese, and she dots the final dish with salmon roe. She’s serving me cold, blanched greens, but confidently. And those cold greens are anything but ordinary. They’re fatty and bright and unexpected. Blamey is more than ready. Running a place like Chumley’s, cooking stunners like this unassuming plate of broccoli, it’s impossible for Blamey not to be on the receiving end of criticism from older generations of customers, the ones who remember the escargot, the Lobster Thermidor. She calls the early months of her tenure the Give-Me-Shepherd’s-Pie Period, in which all the people who knew Chumley’s as a drinking hole came to relive their glory days. But she stuck to her guns (a drunk woman once demanded a side of fries; she refused), and her audience has adjusted accordingly. What was once a dining room that served stodgy writers and firemen drinking low-quality beer now houses a diverse mix of New Yorkers who have come to eat inventively, not get piss-drunk. Blamey is great at her job because she is a creature of constant change. She has moved and traveled often. She welcomes new people into her life as longtime friends. When she adds a dish to the menu and it does well, she feels no qualms about taking it off a few months later and replacing it with something else. She’s always planning the next iteration; a salmon burger with a fried green tomato, maybe, or an île flottante made savory with crab. Otherwise, she explains, she’d go crazy.